Walker's Woods, 2018 Oil on linen 60 x 50 in. 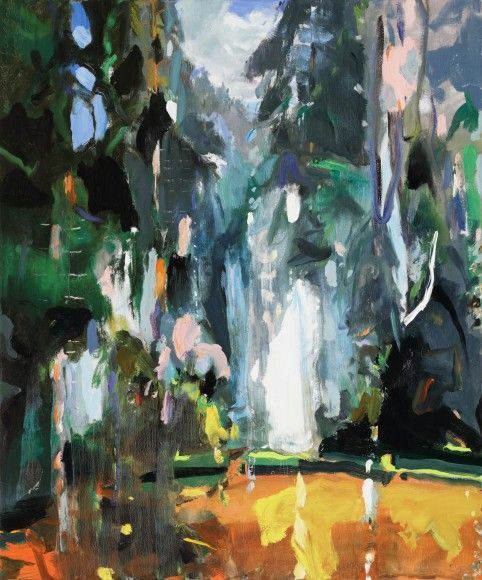 DC Moore Gallery is pleased to present Guide, a solo-exhibition of new paintings by Eric Aho. Aho is known for his landscapes that abstract the natural world, and this new body of work, at times both inviting and confrontational, challenges our understanding of depth in a uniquely painterly manner. Many of the works are large in scale, in order to examine the dichotomy of monstrousness and intimacy that can be found in the deep and complicated architecture of the forest. In “River Guide,” Aho has created a minimalistic river scene, yet the inclusion of a simple horizon line defines the overpowering size of the trees that merge with river. It is frontal, daunting, but simultaneously calming due to the gentle light breaking through the trees and the delicate trace of fishing casting lines that also signify a real and personal experience the artist had there.